Authors are ROCKSTARS! : Fabulous giveaway, but ya gotta do a bit of work first! Fabulous giveaway, but ya gotta do a bit of work first! Hi folks! We hope you've listened to our latest podcast featuring Kiersten White, Cynthia Hand, Marie Lu and Robin LeFevers. 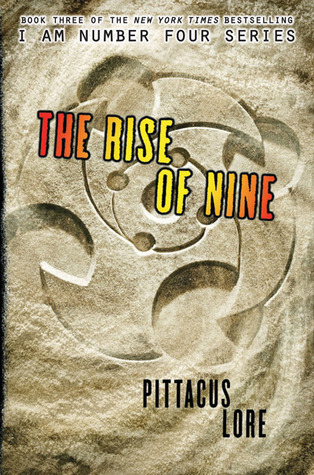 If you have, you heard that Michelle's "Pick of the Month" was the Lorien Legacy series by Pittacus Lore. HarperCollins, the publisher of that series, is seriously awesome. They have given us a complete set of the Lorien Legacy books to give away to one of our amazing listeners! That's right, I Am Number Four, The Power of Six, and The Rise of Nine could all be yours. What do you have to do to get these action packed books of sci-fi goodness in your hands? Well, we're going to make you work for it! We love hearing from you and finding out what questions you'd like us to ask! So, here's a list of our upcoming interviewees. If you have a question you'd like to ask them, leave a comment here (be sure to include your Twitter name or e-mail!) and you'll be entered to win the Lorien Legacy series. - Alyson Noel (The Immortals series, Fated) - Note: Questions for Alyson Noel need to be in by 8/25. So, have at it, folks! What would you like to ask these fabulous authors? You have until August 27th to submit your questions. Contest is open to US residents only. Edit 8/27/12: The giveaway has ended, but we are still taking questions for Michelle Hodkin, Kendare Blake, and Julie Kagawa. Feel free to submit them here or over Twitter @AuthorROCK. OMG! I want to win this so bad!!! Eek! My first question is for Kendare Blake. "Was it harder to write the sequel than it was to write the original?" My second question is for Julie. "Did it take you a long time to decide on writing a vampire story as your next series? Like, did you entertain different ideas or did you always know THE IMMORTAL RULES was your next project?" "All of your titles are really unique and seem to fit the book perfectly, what goes into choosing the title? Does it just come or is there more to it?" "If you had a pen name what would it be?" Thank you so much guys! I love your podcast! Kiersten White in writting your last book of the series Endless was it hard to put everything together and make this the final book for your readers? Do thoughts of finishing a series make you more eager to write another series? Thank-you! Mary Ann, Kiersten isn't one of the authors we are interviewing here. Your choices are Julie Kagawa, Alyson Noel, Kendare Blake or Michelle Hodkin. We so appreciate your enthusiasm though! Alyson Noel when did you discover that you wanted to write books? Do you like to write during the day or at night? Julie Kagawa what made you decide to become an author? Where do you get your inspiration from? Kendare Blake who is your favorite author? what is your favorite book? Michelle Hodkin since writing has your outlook on life changed at all? What is your favorite book to read? Alyson Noel what was your inspiration for writing Fated? you are in my TOP 3 FAVOURITE AUTHORS!! following Kelley armstron and Melissa Marr, i idolise you and your writing capability! love your books, my favourite is 'Fated' cant wait for the next in this awesome series! Q1. How/who from did you get your inspiration for the 'Evermore' series? Q2. Do you idolise someone aswell, e.g. an author? Q3. In writing 'Fated' what gave you the idea to start another series? Q4. Are you going to write another series after 'Fated"? Q5. Where do you get your inspiration from 'Fated'? Q6. Who is your favourite author? THANKYOU SOOOOOOOO MUCH FOR LETTING ME ASK YOU QUESTIONS!!!! Thanks so much for letting me enter this contest!!!! For Kendra and Michelle - have you always been interested in horror/scary/creepy stuff? Do you have tips for writers who want to write horror? How do you build up suspense and tension and create atmosphere in a horror novel? Julie - are you a Shakespeare fan? I'm assuming so because of Puck :) Do you have a favorite Shakespeare play? What made you decide to write a well known Shakespeare character into you book? Thanks to everyone for these GREAT questions! You all rock! For Kendare Blake, do you get any say in your cover art? If so what is your favorite aspect of it? My question for Julie Kagawa and Alyson Noel: I love your books, but I wanted to know what is your inspiration to writing your books? Was it childhood fantasies, dreams, or other books that inspired your stories? And do you have any inputs on your cover art? Please ask Alyson Noel: How did you come up with the entire idea of the Immortal series? What was your biggest challenge when writing it? Julie Kagawa- How did you come up with the idea of The Immortal Rules? I read the Unbecoming of Mara Dyer when it first came out, and was so pleased to discover that the main character has South Asian (East Indian) heritage - something you don't see very often in YA paranormal novels. I would like to know if we will get a deeper sense of Mara's East Indian cultural background in Evolution - it seemed to me that there was a slight hint of mystery with respect to her maternal grandmother.